Have you LIKED The High Chaparral Reunion on Facebook? 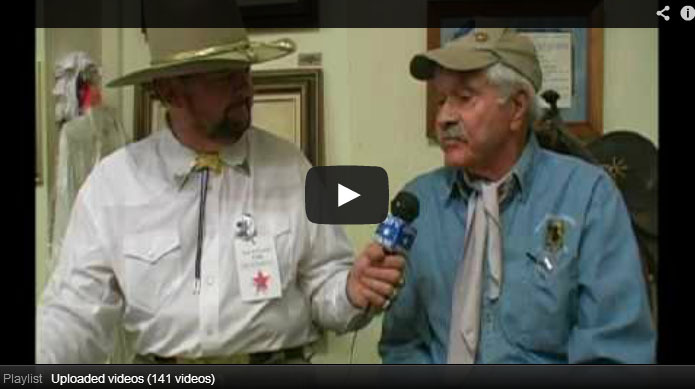 Stop in, click LIKE and watch for HC Ranch Foreman Don Collier's comments on posts and Susan Sukman McCray stops in too. Help us get the world out about The High Chaparral! If you like groups check out the High Chaparral Group for lots of great discussion, photos and links too (you'll see Don and Susan there often). 42 fans have already booked their dream trip to Tucson and The High Chaparral - don't miss your seat! Our heart's are broken today. Our dear friend Ron Janoff has passed away. After a gallant fight over the past year his body and mind couldn't fight any longer. Kent has known Ron for over 45 years and I for almost 40. Kent first met Ron when he was working at Old Tucson in public relations. We were filming The High Chaparral series at the time. During the years, we have had more fun together than anyone can imagine. There were cruises, train trips, parties and of course those annual gin rummy games. The stories and experiences we shared were filled with laughter, and yes, there were some tears. There will be a celebration of his life at his favorite Restaurant in Tucson next week. It is exactly what he would have wanted, a get together so all can spend time telling stories and having some laughs and a toast or two or three or more to Ron's life. He was truly a special man and he was loved and enjoyed by everyone who knew him. Kent and I loved him as family and we will miss him very much. Michael Landon wrote a special "Little House on the Prairie" script.. Within it is a poem that was read at Mike's service by his daughter Leslie. It seems appropriate to share it, for we should all remember Ron with smiles and laughter. For that's the way I'll remember you all. All High Chaparral fans know that one of John Cannon’s unspoken prime directives (a’ la Star Trek Federation) was that all people were to be treated equally, regardless of color, race or ethnicity. Only one thing set men apart to Big John: they were either shooting at him or they weren’t, they either wanted peace or they waged war. That ’s how the characters judged a person on the set. 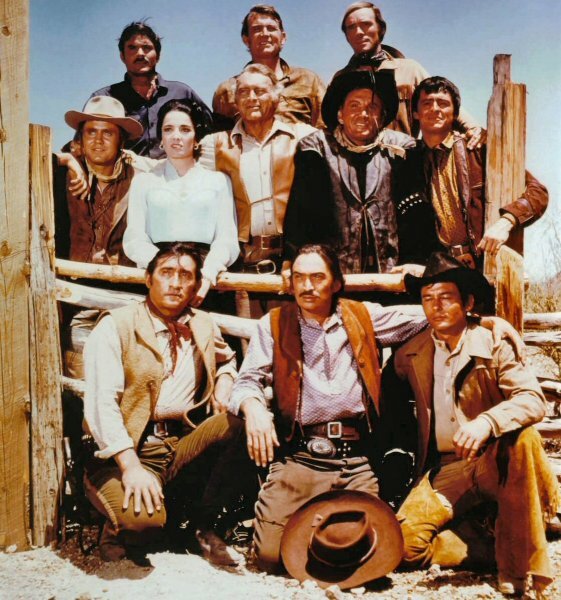 However, behind the scenes, the decision makers on the show were the ones who cemented The High Chaparral as an important and realistic series by insisting on casting and portraying ethnicities with ethnic actors and actresses. People like David Dortort, Kent McCray, William F. Claxton, Buck Houghton, James Schmerer, Don Balluck, Walter Black and, yes, the entire cast as well, made it happen, embraced it, and left their mark in history for it. So, the second season episode called “The Buffalo Soldiers” should not have been a surprise. Touting Yaphet Kotto as the stoic and more-than-capable Sgt Maj Creason, leader of the 10th Cavalry unit, the renowned Buffalo soldiers rode into Tucson. They came at the request of the townsfolk to establish martial law until the local town boss McCoy Hilliard (Morgan Woodward) was corralled. The show’s climax is a cinematic spectacular display in which the Buffalo soldiers perform some outstanding horsemanship maneuvers and literally round up the henchmen and return the town’s control back to the residents. The episode aired on Nov. 22, 1968, the fifth anniversary of JFK’s assassination, and two years after the passage of the Civil Rights Act of 1966. It featured members from the 10th Cavalry Regiment from Los Angeles, which was formed in 1966. Flash ahead 45 years later. Those of you who attended the Old Tucson visit on the Saturday of our recent High Chaparral Reunion were probably thrilled to see a contingent of Buffalo soldiers on hand. However, instead of declaring martial law, they were there to greet you at the Soundstage 2 door as you arrived for lunch. And what a treat it was. The men are part of the Territory of Arizona Buffalo Soldiers, one of several Buffalo soldier groups in the state. Spokesman Charles Young said there are a total of 25 to 30 men in the various units who are proud to represent the Buffalo soldiers and who also eager to educate all who will listen. According to Young, after the Civil War, most of the soldiers returned home and the military was depleted. Congress reorganized the Armed Forces by creating two black mounted units, known as the 9th and 10th (Colored) Cavalry, and four ground units that were eventually combined into the 24th and 25th (Colored) Infantry. Many of the units were sent out West to deal with bandits and Indian uprisings. “If it weren’t for the Buffalo soldiers,” Young continues, “we may never have settled New Mexico and Arizona.” Indeed, history shows that the 9th and 10th Cavalries were stationed in Kansas, Texas, New Mexico, Arizona, and Montana (and many more places) and fought battles against Geronimo, Tularosa, Victorio and other Apache chiefs, as well as the Cheyenne. In addition to staving off hostile attacks, Buffalo soldiers helped protect travelers and mail deliveries, and were touted as some of the earliest park rangers. They are also credited with opening hundreds of miles of new roads as well as stringing hundreds of miles of telegraph wire. The 9th and 10th Cavalries were decommissioned in the mid-1940’s and 50’s and re-commissioned later as racially integrated units. The Buffalo Soldiers of yesterday were the stuff of which legends are made and hope rekindled. That hope has been translated into action by these men, the Buffalo Soldiers of today, who carry on in the tradition of the famed 10th Cavalry, determined that the patriotic spirit of that great troop must live and must flourish so that all of us can recall and cherish the historic and continuing contribution of the Black American to the life and progress of our Nation. For more information about the Territory of Arizona Buffalo Soldiers, contact Charles Young at ewyoung@aol.com, or visit an affiliated group at www.10thcavtroopb.org. For more information about The High Chaparral, you’re already in the right place. This Western (produced by David Dortort of Bonanza fame) is named for the ranch upon which it takes place. The ranch is owned by "Big John" Cannon (Leif Erickson, and he's got troubles. His land in Arizona is dry and rough; Cochies and 600 Indians are trying to do him in; a Mexican cattle baron to the south is giving him a hard time; and his hard drinking, hard fighting brother (Cameron Mitchell) never seems to change his clothes. Also, Big John's wife has been killed by the Injuns; he has been forced into a marraige of convenience with the beautiful daughter (Linda Cristal) of the Mexican big shot; and he has the surliest, most doltish son (Blue, played by Mark Slade) since Orestes, who can't seem to do anyting right except sulk. Against these odds Big John will prevail. he has Bonanza leading the way. Debut: NBC, Sept 10. The first year’s run of The High Chaparral didn’t quite fulfill all expectations. Before the series arrived Sept. 10, it was supposed to bury all the opposition and make international celebrities of Leif Erickson, Cameron Mitchell, Linda Cristal, Mark Slade and Henry Darrow. A season later, however it is being shifted, politely from 10 p.m. eastern time Sunday to 7:30 p.m., Fridays on NBC. Its old timeslot is being turned over to “The Beautiful Phyllis Diller Show,” a variety-comedy series. Few accuse producer-series creator David Dortort of having turned out a failure but some are disappointed. Curiously, in a television business that has more curiosities than commonplaces, no one seemed to recall that Bonanza wasn’t an instant success. It began on NBC at 7:30 p.m., Saturdays, opposite Perry Mason and consistently ran a poor second. Its big impact came only after it was moved to its present Sunday home. (Where, incidentally, it got even with Perry Mason and caused that series to end; not counting re-runs). 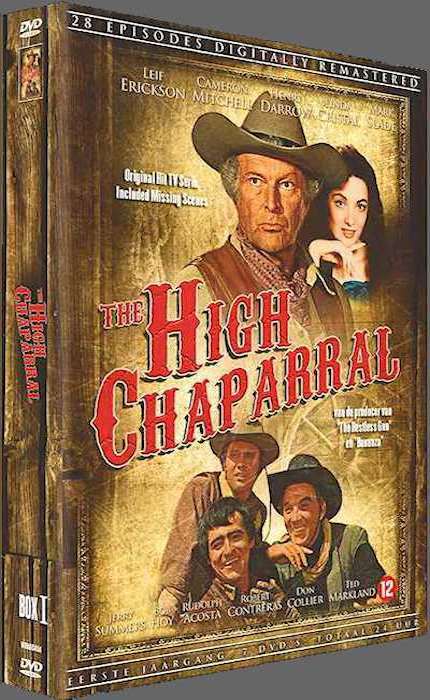 After one year, The High Chaparral continues to have an unbelievable air about it. Big John Cannon (Erikson) has a relationships with his wife, Victoria (Miss Cristal) that can be most charitably described as antiseptic. He got forced into the marriage to save his ranch and, after 26 original episodes he treats his wife like an unwanted stepchild. The warmth that made Ben Cartwright a favorite of 400-million viewers in 108 countries is entirely lacking in John Cannon. Of course, he always does do it and, somehow, the ranch manages to survive. The character of Cannon took on the more unfortunate aspects of Ben Cartwright. For years, every romance for Hoss or Little Joe Cartwright has ended with the girl dying or leaving town. The same afflictions are now being suffered by the females who spend time with Billy Blue or Buck Cannon. Buck, from time to time, has a strong yen for his brother’s unkissed bride, but in Dortort’s westernized version of soap opera, such yearnings must be suppressed by honor or depressed by the sudden presence of marauding Indians. The other day, I got to thinking again. I wondered about why we call cowboys ‘cowboys’ and what they are called in other countries. As we know, cowboy is a North American term for men who work around stock, usually beef. The name is first recorded in English in 1725 and is believed to be a translation of the Spanish, vaquero. As children were often given the responsibility of tending small stock (or up to a few larger animals) it evolved from the title given to boys who tended cows. In other words, cow shepherds. But steers aren’t cows, which makes you wonder why they aren’t called steerboys or cattleboys. In fact, it isn’t even boys who do the work now it’s men. So why aren’t they steermen, cattle handlers or cattlemen? Well actually, I have heard the expression cattlemen as in ‘cattlemen’s market’. But it does make you think, doesn’t it? Cowboys don’t just round up cattle and get it off to market. They do all sorts of things around the ranch based on their skills. After all, the herds tend to look after themselves once they’re in the pasture. Once they’ve been sold and the rancher awaits a new herd, there’s still work to be done at the ranch. As the names suggest, cowpokes, cow hands and cowpunchers were people, usually cowboys, who poked and prodded the cattle along the track with the less considerate, opting to punch the animal. Cowgirls were far rarer in the 19th century and those who called themselves such, earned great respect from their male counterparts because they didn’t expect special privileges. They worked every bit as hard and got every bit as injured when accidents happened. I wondered why, if there were so many Chinese migrants in the Old West, you never heard of a Chinese cowboy. Today we hire people based on ability but back then, Chinese people were distrusted. They dressed and spoke in peculiar ways, ate unusually spiced foods and often burned strangely perfumed incense. For these reasons they were not invited to try out for cowboy positions even if they had wanted to. Instead they tended to open laundries, opium parlors or other less savory businesses. The latter two did little to improve their image. It comes as no surprise to learn that North America doesn’t have a monopoly on cowboys although they are still the ones who first spring to mind when the name is mentioned. In other countries, the cowboys may perform similar tasks but are called by different names. Australian cowboys are called stockmen or jackaroos (also spelled jackeroos). The cowgirls are jillaroos thought technically, jackaroos and jillaroos are trainee stock people who work on sheep or cattle stations. The word originates from Queensland around 1850 but spread nationwide. Although people use the words interchangeably, the stockman is the true ‘cowboy’. I thought maybe the ‘roo ending tied in with this being the land of the kangaroo and since the nursery rhyme about Jack and Jill was popular when the name was coined I wonder, but I suspect I am wrong. However, my guess is as good as anyone’s since there are many other theories as to its origin. The closest theory to mine is that it was a generic name for a ‘Jack of all trades who worked around kangaroos’. It still doesn’t account for the choice of Jill for the ladies. With American cowboys also called buckaroos, this may have become a hybrid for Jack of all trades/buckaroo - jackaroo. These names soon crossed the Tasman Sea to New Zealand where they are also used. Roustabouts and ringers are the younger males commonly on sheep stations, usually spending a lot of time cleaning the sheds as they can get very untidy. Shearers take pride in sheering a sheep with speed and accuracy and ‘ringer’ is the title given to the fastest shearer. This is where we get expressions like, ‘He’s a ringer for the job’ which means he is the best person for it. 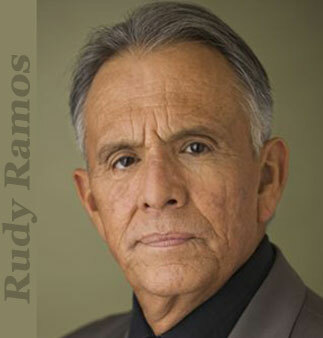 Mexican cowboys were called vaqueros which gives High Chaparral’s Rudolpho Acosta’s character, ‘Vaquero’ new meaning. We always knew he was a sort of handyman around the place but this tells us that he was as equal to the task of being a cowboy as any of the others at the ranch. The word is derived from the Spanish ‘vaca’ which means cow. Gauchos are the cowboys of the South American pampas. They are famous for their horsemanship and fighting skills, in addition to their stock handling abilities. In central Asian countries extending to northern China and Russia, people don’t have a name for their stock herders. They tend to be called ‘pastoralists’ and are known as herders of whatever stock they handle. So we find them called names like cattle herders, horse, sheep and goat herders. They also differ from the modern cowboy in the sense that rather than performing a variety of tasks that focus around the importance of the ranch, the stock is their life. Pastoral tribes, such as the Toda tribes of the Nilgiri Hills in southern India, become expert herders of specific species. The Toda specialize in buffalo and tend to be nomadic, travelling with their herds rather than having a ranch style set up for them. Cowboys like the American and Aussie ranchers raise meat for sale with animal hides used for leather and clothing. The pastoralists rely on their animals more for milk than meat though they do eat their animals when the time is right. Like their Western counterparts, the hides are used for clothing and other leather goods but unlike the cowboy, dung is collected and burned as fuels while bones can also be used for utensils where necessary. As with the Australian and New Zealand growers, in addition to hides having uses, wool is also used for clothing from wool producing animals like sheep and llamas. The most interesting discovery I made was that we have Indian cowboys. When you think of the times children played cowboys and Indians in the past, I was taken by surprise to learn this yet it makes perfect sense. Since the late 19th century, Plains Indians have been involved in cattle growing. Their skills on horseback also led to the rise of the rodeo in North America. With the expansion of white settlers across the land, Indians had to adapt. Buffalo hunting became illegal and much of their land was lost to treaties and the like. While some Indians settled to farming, most were unsatisfied by the lifestyle. The best way to survive was to become cattle growers like many of the settlers. Among Indians, rodeos were social events where they could show off their horsemanship skills and hope to instill a love of it for future generations. The events soon caught the eyes of their white brothers and this led to Indians earning extra money as they were paid to join a local rodeo as one of the acts. White cowboys soon joined rodeos to show off their skills along with the Indians. Plains Indians, both men and women, continue to be rodeo/cowboys. It would be most interesting to get the cowboys of all nations together to ‘spin a few yarns’ about their experiences. I expect that we would find that despite cultural differences they have more in common than not. Prior to developing a system for raising large herds of beef on the land, people raised pigs because cows were too expensive to keep. With Western expansion and the arrival of migrants to the US, in particular the Spanish who introduced various techniques and equipment to cowboys, beef became easier to raise and large scale ranches evolved. In Third World countries, cows are still valuable property because the lack of good grazing land, poor water supplies and overcrowded cities forming where good land is found, continues to make raising cattle an extremely expensive occupation.